The Outline Stitch in needlepoint is very versatile and can be worked to form horizontal, vertical or diagonal lines and rows on a needlepoint design. It looks best when used to define previously worked Continental, Basketweave or Slanted Gobelin needlepoint stitches. If made in a contrasting color from the stitched area, the backstitches will be more prominent than the other stitches. 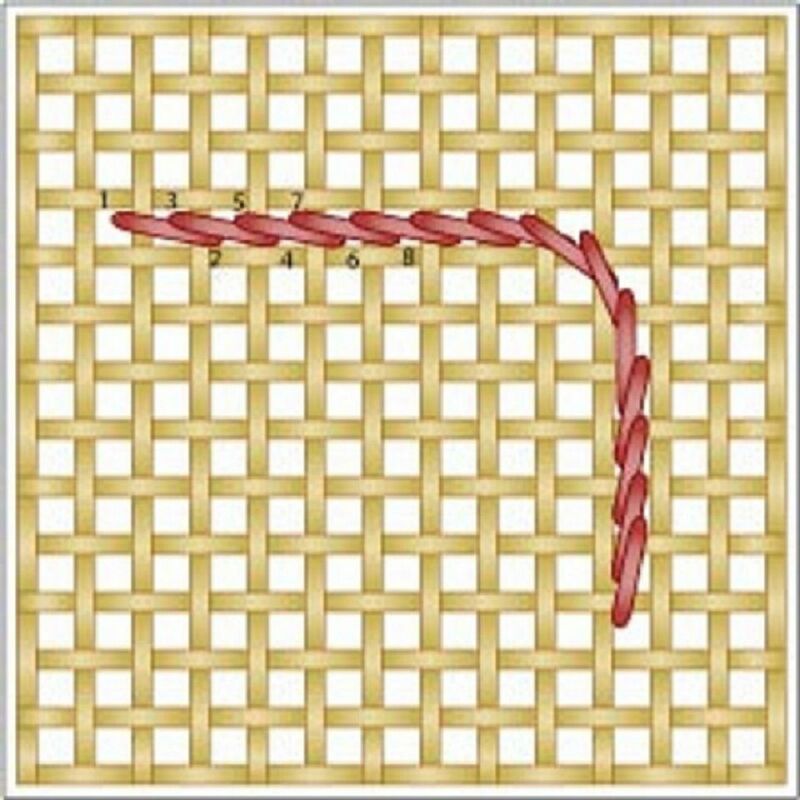 When worked alone, outline and backstitches can be used for stems and tendrils on flowers and plants, as well as for needlepoint alphabets, words, sentences, and phrases worked on top of other stitches. To give your needlepoint a professional designer touch, consider working a series of outline or backstitches before removing the completed needlework for final blocking and finishing. Here are several reasons to give the backstitch or outline stitch a try when working your next needlepoint project. Outline and backstitches add more color and decoration to the finished project—especially if you work them in darker shades or contrasting colors with specialty or novelty threads. If after having completed stitching, you notice that the canvas is showing through, work backstitches in the same color and thread as the stitched area to completely cover the canvas. The backstitches will sink into the canvas and be almost invisible, and you will not be able to see any mesh threads. Outline stitches can also be used as filler and compensating stitches for small areas—usually in corners or at the top and bottom of the needlepoint canvas. When working a needlepoint border, the backstitch can be used to square off the corners for a professional finish. Backstitches can make a design on square needlepoint canvas look round and smooth as it is easy to turn corners and make circles with these versatile stitches. A single strand or ply of the thread you've selected is usually all that’s needed to work a row of backstitches. If you stitch the needlepoint project in tapestry wool or another heavyweight single-strand thread, you will need to use a lighter weight fiber, such as one ply of Persian Yarn. Thread the tapestry needle with one ply of yarn. Using​ the image above as a guide, bring the needle and thread up from the back of the canvas at position 1, and insert it back down into the canvas two threads backward or to the right at position 2. Come up at position 3, which is one small stitch ahead of the last stitch. Go over two stitches again down into the canvas at position 4. Repeat the above step for positions 5 through 8 and beyond, following the outline of the needlepoint motif or area you wish to highlight. As you continue to work, you will notice that the stitches on the back of the canvas are longer than those on the front. This effect increases the amount of thread coverage on the back of your piece and makes it easy to block the finished needlework. Use a light, gentle and even stitching tension and be careful not to distort or split the canvas threads as you work. As you make the backstitches, give the thread just enough of a tight twist to distinguish it from other background needlepoint stitches.